Preheat the oven to 425 degrees F. Lay a 2 1/2-foot-long sheet of aluminum foil on a baking sheet, letting the ends hang off. Lay another sheet of foil perpendicular on top. Rinse the couscous in a fine-mesh sieve under cold water. Mix the olive oil, paprika and 3/4 teaspoon each salt and pepper in a small bowl. Pile the couscous in the center of the foil; toss with 1/2 tablespoon of the seasoned oil and spread in an 8-inch-square layer.Brush the fish fillets on both sides with 1 tablespoon of the seasoned oil and arrange side by side on top of the couscous. 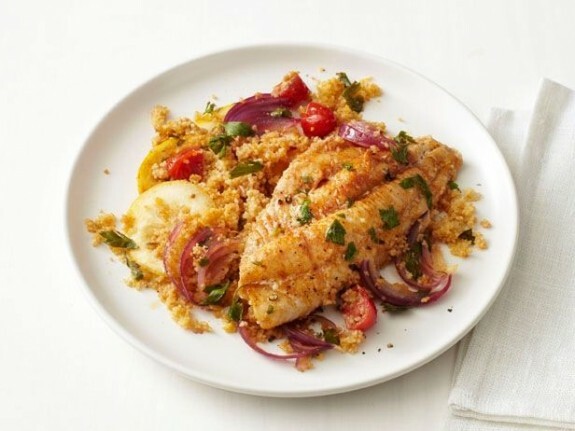 Toss the lemon slices, parsley, red onion, tomatoes, garlic and the remaining 1/2 tablespoon seasoned oil in a bowl, then scatter evenly over the fish and couscous. Drizzle with 2/3 cup water, then bring the opposite ends of the foil together, fold over and crimp closed to make a sealed packet. Transfer the foil packet (on the baking sheet) to the oven and bake 25 minutes. Open the foil packet; divide the fish among plates. Toss the couscous and vegetables; serve with the fish. Sprinkle with the lemon juice.